Belgian Chocolate Covered Cherries is rated 4.8 out of 5 by 4. Rated 4 out of 5 by Sailor13 from Belgian Chocolate cherries I bought my husband the Belgian Chocolate Cherries. Absolutely delicious. I just thought they looked small. Rated 5 out of 5 by Bluejen from Right on time Your wonderful chocolate covered cherries arrived fresh and on time for my Mom's 72nd birthday. She just LOVED them! Thank you so much! Rated 5 out of 5 by JayNT from Great product. Stellar Service! As happens during the holiday rush there was a mix-up with our order and we didn't get exactly what we ordered, but something similar. When I informed Gourmet Gift baskets about the problem they immediately did everything they could to make it right and soon after we received the product we had ordered. You can't judge a company when things are going smoothly, how they handle the unavoidable mishaps is when you find out how good the company is and I found out that Gourmet Gift baskets is the kind of company I want to do business with. Thanks so much and the Belgian Chocolate Covered Cherries were beyond decadent. Rated 5 out of 5 by wanda jean from MOTHER'S DAY GIFT, BELGIUM CHOCOLATE CHERRIES My mother called and was so thrilled with the chocolates. She said they were delicious. They are her favorite candies since childhood and she is 82 years old and she said they were the best of all ever. 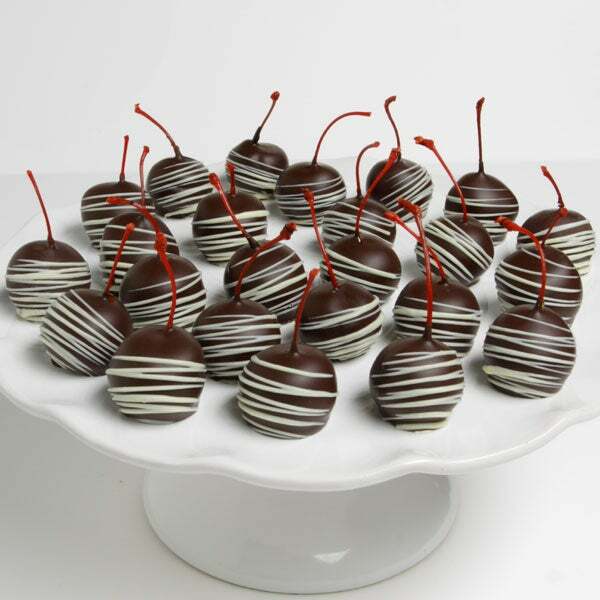 Sweet, maraschino cherries are gently double dipped into a bath of decadent Belgian dark chocolate and decorated with ribbons of a sweet candy drizzle.